I think I could start a blog just about dreams. Referring to literal dreams at night. I’ve had some odd ones. If you promise not to try and interpret and tell me the symbolism I’ll share another one. A quick preface first. I used to watch the television show Psych when it was on Friday nights. When it switched to Wednesday nights though, I couldn’t make the switch with it. Here in my time zone it comes on 11:00 at night. On a Wednesday. I’m too old to stay up and watch it. I mean, I can’t get to work on time as it is. I am also one of the few people without (gulp) a TiVo. Don’t feel sorry for me – I prefer it that way. If I’m not here to watch a show then I don’t need to see it. At least, that’s what I keep telling myself. Plus, there’s the fail-safe internet that I can usually catch up with a show the next day. However, USA has now beaten CBS for the least user friendly website. This network has done its upmost darndest to make it difficult to watch USA shows. This has made watching Psych not a priority for me. When I think of it, I watch it Saturday mornings when USA replays the episode. To be honest, it’s hard to think of things on a Saturday morning. That’s my lazy time. Wow! How lazy do you have to be to be too lazy to watch tv? What can I say, it’s a talent of mine. 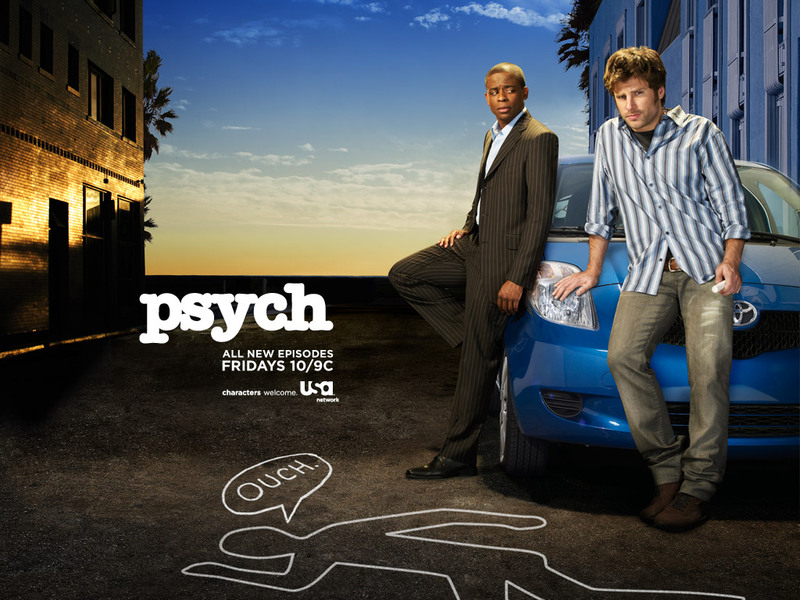 While we’re discussing it, may I just say I’m surprised Psych is still on the air? It’s the show that keeps on ticking despite USA’s attempts at dusting it under the rug. How many NCIS marathons do we really need? Or Law and Order SVU? Couldn’t you mix it up a little and maybe, just maybe, pay as much attention to some of your own shows once in a while? Okay, back on topic. I managed to watch the season finale when Henry was shot. And I happened to catch the end of the season premiere (on a Saturday, natch) to see how that worked out (sorry, no spoilers here). But it’s been a couple of weeks since I even thought about the television show or even watched it. That was a rather lengthy setup just to get to this. I had a dream the other night that I was in the show Psych. Not in the show but more like the show was a part of my life. This is what went down. Juliette and Shawn broke up. This made me quite sad because obviously, they have true love. One quick question, does she know he isn’t an actual psychic or is their relationship built on his continuing lie? Because nothing says loving like…lying. Anyway, the couple broke up and I was quite sad for them. Shawn and Gus took off on their own to pout. The rest of us (Juliette, Lassiter, and the Chief) got into a car very similar to the car Gus drives. If I remember right, we were looking for Gus and Shawn? Actually, I can’t really remember where we were going. It’s possible we were looking for bad guys. But we didn’t get far because some very, very bad people ran into us. Literally. Since the car is so small they were able to push us into this dead-end alley (conveniently just big enough to fit the car in it). We got out and looked around and recognized we were in trouble. This exact scenario happened to somebody else who (of course) ended up dead. It didn’t take long for us to realize we needed help. We needed Shawn to come and look at things. Perhaps so that the clues could glow and we’d figure out who the bad people were and everyone would be safe. I was elected to go and find Shawn and Gus. In my defense, I live in the desert and the show takes place in Santa Barbara. I became sidetracked with the ocean. And so I went swimming in a pool right next to the ocean instead of looking for the two missing friends. Another strange plot point – the pool was a kiddie pool filled with more sand than water. I actually swam in muddy sand. In a side note, I felt dirty all day after I woke up. Sadly, I never did find Shawn and Gus because I woke up. I felt such an urgency in finding them though that I tried to fall back to sleep so that I could finish my duty. My one job to do. Too bad I didn’t feel that same importance when I got sidetracked with the whole beach scene. Unfortunately, I never found out who the bad guys were. Or what exactly was going on. And the worst part, I never found out if Shawn and Juliette got back together. I sure hope they did. And if so, I really hope he isn’t lying to her anymore.